May Music Favorites 2018 — Christine Celine. Spring has sprung and my mood is lifted! I hope May is treating you well and the sunshine kisses your face. 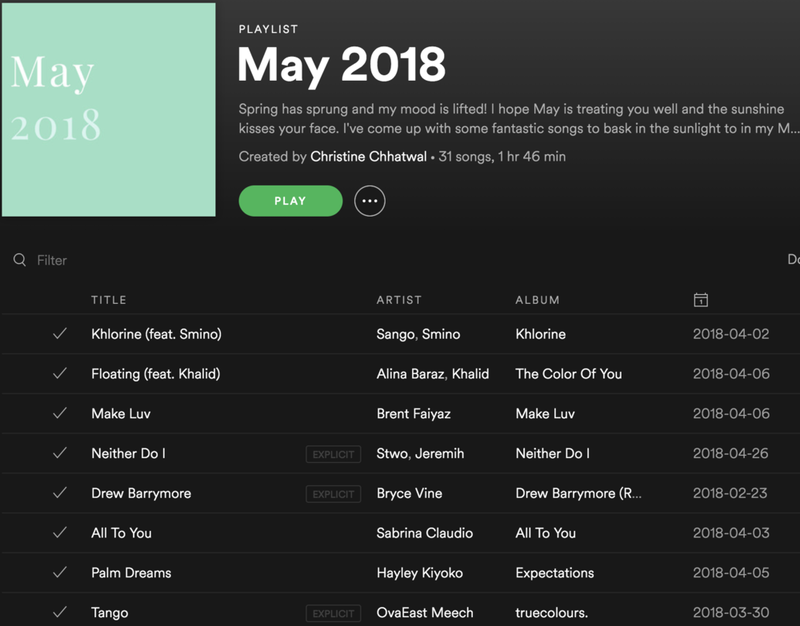 I've come up with some fantastic songs to bask in the sunlight to in my May Music Favorites 2018 playlist! I have been enjoying these picks so much and I hope you love them too! Sprawl out, get your favorite beverages and sunnies and prepare for summer with these songs! Remember to follow the playlists on Spotify for quick access or YouTube if you prefer! Don't forget that you can follow me on Spotify for new playlists every month! Also if you want to see me be my usual weird self and go on an adventure, watch the YouTube video for my May Music Favorites here! I love this song so much. It's so upbeat and a great song to throw on in the car. This is definitely my top favorite song from Sango's new album. Please do yourself a favor and listen to Alina's new album: The Color of You. It's a beautiful masterpiece and I had such a difficult time choosing which song to share. This one is another great collab with Khalid and it just flows so beautifully. I have loved Brent ever since Crew by GoldLink and fam came out. This track grew on me and his voice is so silky. I never heard of Maejor before but this song is another great one to pop on when I'm driving to class and trying to destress. Something about this track has me hooked. I saw Stwo open for Snakehips but I looked over this song. I think it's really chill and always gets stuck in my head because of Jeremih's hook. I found this one accidentally when I was trying to listen to Drew Barrymore by SZA. I'm not even mad however because this song is a great one too. I had to give a nod to Sabrina Claudio since she released this single in April. It's sultry and magical all at once. If you like Ice Cream, you should check out one of my favorite stores in my May Music Favorites video. This song oozes summer vibes and its perfect now that the temperatures are rising. I love the electronic beat, it floats and flutters with a catchy chorus. Probably my favorite song from John Legend as of late. I can definitely see this becoming a song at all future summer weddings. It's so upbeat and cute the way John sings about meeting his wife. A nice recovery from a good night if I say so myself. I love throwing this on at night when I am winding down from the day. I've been slowly creeping into my indie phase and this is a great one for that. Snakehips always faithfully makes perfect summer songs. I think this song is so great for my walks around the city. I always want to just start singing along. Have you listened to Kali Uchis' new album Isolation? Go, go, go! I love this album and this song and another one I will feature next month are so well produced. I think this song is a perfect backdrop for your summer hangouts. Tom Misch is another consistent artist for some relaxing and inspiring sounds. I love that he collaborated with GoldLink. It's a pairing made to get lost in Paris. Taking it slow for a moment with some acoustics on this one. I think this song is a nice reprieve from all the summer feels. This song is a nod to my Day 1s. I am thankful for all of my friends and man for sticking by my side. I can't thank you enough. HONNE has some really great songs out right now and this one in particular makes me so happy and ready for the summer days ahead. I wasn't expecting these artists on one track but I am glad it happened. This is definitely a nod to my ride or dies. I think this song is perfect to dance along to like no one is watching. Another sad song that lead my Spotify Discover Weekly to thinking I am going through some break up. I'm not but this song just captivated me. I love singing along to Billie Eilish's voice. Her sound is very delicate and ethereal but also strong and assertive. Ah! I was so excited Sinead Harnett came out with a new song because there are only so many times a girl can play her previous albums in a month. This song is so catchy and sultry as always and Sinead's voice is mesmerizing. Oh man, if you didn't know, I have been playing this song A LOT. I love the sample she used and the drum beats are in the perfect places and complement Alina's voice so well. I think that this is going to make an appearance all summer for me. What's your favorite song from The Color of You? This is definitely Top 3 for me. Some wise words and a pop beat to float through. Sometimes I do regret those dumb fights that led to an end of a good friendship. This song definitely encompasses that and reminds us all to just do right and treat others with kindness and compassion. Spring has sprung! It's 73 degrees outside, man! This song is literally spring/summer personified. I also love that sax from Masego. My favorite line is too inappropriate to list here but I hope it's your favorite line as well. (Hint* Say my name). My favorite women on one track. I've been bumpin' to this especially at the Cardi B spin class my friend and I took in April. ICYMI Cardi B is so fun to workout to. Another lazy Sunday kind of track. I really love the chorus and Russ on this one. So chill and perfect for those drives home. Love this song. Reminds me of J. Cole. Calling all my strong and independent ladies. Focus on yourself and love yourself genuinely. If you're going through a breakup (or not), this is a great song that touts some pretty true lyrics on valuing yourself and taking time to self-care. I'm trying to workout and drink more water so I mean, it's true. This song is mesmerizing. It flutters before getting heavier and more layered. I think this is a really underrated track and deserves more recognition. At first I had mixed feelings because I am so in love with Daniel Caesar's original but this cover has it's own style akin to Miguel and I love it the more and more I listen to it. Another great song for summer, workouts and more. Yes, this is a great song. I am sure you've heard it if you saw Cardi B's pregnancy announcement. I'm captivated by Cardi B and I am not even sorry. I hope you love these songs because they're definitely all amazing! Let me know which ones are your favorites below as well as any song suggestions you may have. Also, check out Post Malone's new album, I can't even wait for June to share which songs are my favorites. Better Now and Stay are so good and I've been listening to them on repeat.